La Traviata by Giuseppe Verdi, which made its debut in 1853 at the Teatro La Fenice, only became the most successful opera in the world after it was revised. The title figure of this famous, but hopeless love story set in 19th century Paris, is the courtesan Violetta Valery, who falls in love with Alfredo Germont, the son of a respected Parisian family. Alfredo’s father does not approve of the relationship and asks Violetta, who is already gravely ill, to leave Alfredo with whom she is happily living in the country. The pain of giving up the love of her life drives Violetta back to her old life as a courtesan, where her condition dramatically deteriorates. Only after Alfredo’s father reveals Violetta's sacrifice, are the couple reunited. However, their happiness lasts only a few moments before Violetta dies in the arms of her lover. The opera "La Traviata" is a part of the cycle "Musica a Palazzo"
At the Palazzo Barbarigo Minotto you can experience the unique musical highlight “Musica a Palazzo” right on the Grand Canal in the heart of the city and offers opera lovers a feast for both the eyes and the ears. The entertaining combination of opera performances in the historic setting of the aristocratic Barbarigo-Minotto palace revives the tradition of the salon, which since the 17th century had been a place where musicians, writers and philosophers had gathered. These popular gatherings, which met almost exclusively in private homes, often centered on a piano. The pianist was often accompanied by string instruments and one or two singers, creating a small chamber ensemble that offered the invited guests a jolly evening of entertainment. The Musica a Palazzo ensemble is made up of extraordinarily talented artists with international reputations, who shine in even a small formation, and captivate the audience with their passionate virtuosity. 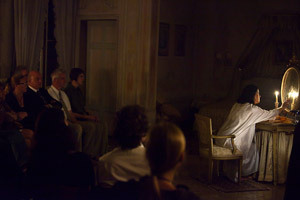 Every act, each scene is played in a different room, for example the Sala Tiepolo, which boasts an original fresco by the Venetian painter, allowing listeners to enjoy operas like La Traviata, The Barber of Seville, Rigoletto and the most beautiful romantic duets up close in the intimacy of the palace’s small rooms.